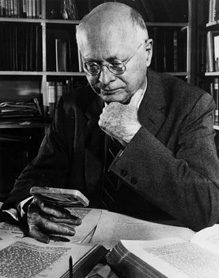 Archaeologist and Biblical scholar William Foxwell Albright introduced critical assessment of the historical context of the scripture, instead of merely teaching it as Gospel, and his work helped establish the Bible's value in historical studies. He was known for his encyclopedic knowledge of the ancient Near East, and was considered a leading authority in the field of epigraphy (the study of ancient inscriptions) and biblical archeology. He is best known for his 1948 work authenticating the Dead Sea Scrolls, a series of fragmentary manuscripts discovered in 1947 in the West Bank of Palestine, which are the oldest known surviving copies of Biblical and biblically-related documents. Albright's left hand was mangled in a farm accident when he was a boy and rendered largely useless. He was also very nearsighted, and taught himself Braille as a child because he feared that he would lose his limited eyesight. He studied and taught at Johns Hopkins University, made major contributions to the technique of dating archaeological ruins based on ceramic typologies, and edited the Anchor Bible Commentary Series volumes on Jeremiah, Matthew, and Revelation.